Pub in Docklands, midway between Royal Albert Station and Prince Regent Station on the Beckton branch of the DLR. 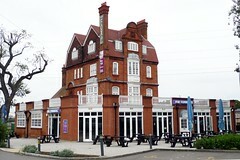 It also has accommodation available, and like its sister pub, Fox ExCel, it's close to the ExCel exhibition centre. Inside, it's one large room, with plenty of varnished dark wood tables and chairs complemented with a few sofas and armchairs as well as a tucked-away banquette area to one side. A patterned carpet covers the floor, and there are at least three flatscreens. There's what looks like a dining area, separated from the rest of the pub by frosted glass. It has a fair bit of outside seating; none of this is under cover, but it does have a good view of planes (going to and from London City Airport) and DLR trains (on a raised trackway). There's also a small children's play area with a slide and swing playhouse and grassed areas. Kake, Ewan, and other Tube Walkers visited on a Sunday afternoon in June 2013. Three handpumps on the bar offered Brains SA, Brains The Rev James, and one other that we failed to note the name of but that looked interesting rather than standard/common. They also had keg Bass and Franzikaner lager, among other things. A pint of lime and soda was £2. It was very sunny and there were a lot of people sitting outside, so plenty of space inside. It took quite a long time to get served at the bar, though this was partly because we arrived during a rush. The flatscreens were showing sport with the sound off. Music was playing quite loudly for an afternoon. According to menus on our visit, as of June 2013 food is served noon-late (definitely Mon-Sat, possibly only noon-5pm on Sun). The restaurant area may have a different menu to the pub area; we're not sure. Photos of the pub menu as of June 2013: 1, 2, 3, 4. Accessibility: No steps to get in, and the bar, seating area, and RADAR-locked accessible toilet are on the same level. It's also step-free to the ladies' toilet, though there are two steps to the gents'. Last visited by Kake, Ewan, and other Tube Walkers, June 2013. Page last edited 2013-07-03 20:20:36 (version 1).